There are many sources of fish leather. 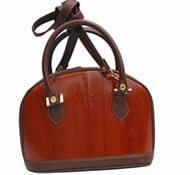 In this website we mentioned leather from eel, stingray and shark. Now we come to salmon leather. Salmon skin has been a source of leather for a long time for natives of the Pacific Northwest (think native American Indians). The skin was at first a waste product from the food industry and now has become leather. 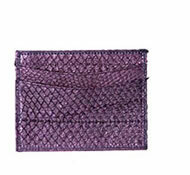 Fish leather from salmon are made into wallets and would you know, shoes, too! Fish leather is supple, soft, breathable, strong and often attractively patterned (think grain or grain of leather). Chinook salmon (Oncorhynchus tshawytscha), also known as King. The oldest recorded salmon is Maine, USA, with the age of 13 years. No, but the wild species are endangered. Examples are the Coho salmon and the Chinook salmon. Yes, they are. When caught by fishing lines as in sport fishing, they are always fighting to get back to the water. When caught in nets, they attempt to drag the net with them or try to get out. Accidents happen from the struggle of salmon trying to escape but we do not have any information available. Our apologies. How can one get killed in a fatal accident involving salmon? Maybe the fish drags down the fisherman into the water till he drowns? Or that in the struggle, the fisherman knocks his head on something? Sorry, we don't have any available information. Yes, a very popular favorite. Fish, definitely. And they are oh so good. One of us went to a Japanese restuarant. He'd like to go back there some time but it's very pricy. Should go once in a while and not too often. The female salmon lays fertilized salmon eggs in stream bottom gravel nests called redds. These eggs are usually orange to red in colour. The eggs hatch into alevin or sac fry. The fry quickly develop into parr with camouflaging vertical stripes. The parr stay for one to three years in their native stream before becoming smolts. The smolt body chemistry changes allowing them to live in salt water. As soon as they become covered with silvery scales they are called grilse. They migrate to the ocean where they will develop in about two to three years, (depending on the species) into mature salmon. 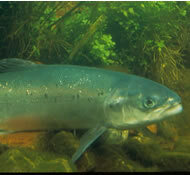 After they develop, the adult salmon will return to its native stream, breed, spawn and die. When it spawns, depending on the species, the salmon undergoes gruesome changes. Some grow a hump, others develop canine teeth and change colors, they rot while they are still alive. No one knows why they go back to the stream they were born in to die, but in order to complete their cycle they must die. Before they die the females release the eggs and the males fertilize them. Salmon in general eat krill and small shrimps or other shellfish. The Sockeye salmon feeds exclusively on plankton. The Chinook salmon feeds on insects and on other fish, too! Salmon are raised in fish farms called "aquaculture." The water in the aqualculture is heavily oxygenated. This is important for the salmon to live. They are fed live krill and small shrimps. They are also fed specialized feeds containing nutrients and additives to enhance color of the meat. This has become a very contraversial issue to the extent that some groups promote wildly caught salmon to those of farmed salmon (health benefits, obviously). To add to all that, some wild species are becoming hard to find due to overfishing. Anyway, commercial fishermen, government bodies, environmental concerned groups, and commercial aquaculture businesses are finding ways for all of us, to enjoy salmon and at the same time conserve it. May it be successful, and the sooner the better. The usual harvesting size based on aquaculture is about 1.73 lbs (0.78 kg.) in weight and 17.3 in. (43.942 cm.) in length. The tanning process takes from four to seven weeks. To prepare the skins for tanning all flesh remnants are removed, and the skins are put into drums with a special fluid that puffs them slightly. This process helps the scales fall away without damaging the skins. The hardest part of the process, is to get the leftover flesh off the hides. The tanners have to be careful not to rip the hides during this process. Chemicals turn the skins into leather, and the fish odor is gone. The skins are dyed, softened and dried and then softened with oils again. The skins become durable, soft and water resistant when they are ready for commercial use. It is a durable and beautiful leather. This bit of trivia came from Scotland: After the leather process, it can be made into swimwear. It acquires a quality called "natural memory" which allows it to retain the shape of the wearer both in and out of the water, and it dries swiftly, too! Hmmm, the perfect bikini. The leather is soft, like snakeskin. 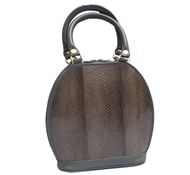 It has a scaly pattern similar to snakeskin.